We have set aside next Sunday to celebrate the Resurrection of our Lord. Our family does not refer to the day as Easter. Nor do we associate with bunnies and Easter eggs. A study on the background of the word and history would explain the reasons why. However, we have chosen to refer to the day as Resurrection Sunday. In fact, every Sunday should be a reminder of our Lord’s resurrection. But this day is set aside as a special day to commemorate this event. I will spend this week preparing my heart by reading the accounts from the gospels of Christ’s death, burial, and resurrection. 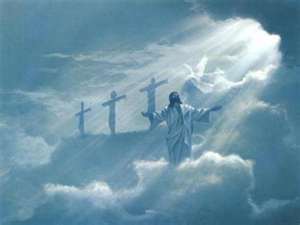 Will your family be celebrating the Resurrection of Christ this next week? If so, how are you preparing your hearts? My husband’s sermon on Sunday really touched me. It was titled Dealing With Jesus. Taken from Luke 22:47-23:25, the question posed was, “How will you deal with Jesus?” We must all answer this question. My first reaction (and maybe you can relate) was I’m not like any of these people. But after a deep look into my heart I had to acknowledge that at some point in my life I have been like all of these. While my deception was not as sinister as Judas’, I have tried to deceive my Lord. It usually comes in the form of a prayer. And while my heart cries one thing, the Lord knows me much better than I even know myself. Therefore, it is impossible to deceive Him. While my denial was not as blatant as Peter’s, I have denied my Lord in times past. This denial usually comes in the form of omission. There are times I should speak out in behalf of my Lord but I refuse. In that refusal I deny Him. While my doubt is not as ominous as the Counsels, I have doubted my Lord. I have doubted His Word. I have doubted His provisions. I have doubted His faithfulness. This shows up when I worry and fret. When my faith is strong I do not doubt. But when my faith is weak, doubts arise in my heart. While my delaying is not as much as a hindrance as Pilate’s, I have many times delayed decisions. The Spirit has spoken to my heart to do something. I have read in God’s Word and been convicted toward action. I have prayed and known what God would want me to do. Yet, I have procrastinated. I have delayed my decision. Sadly, we all know that a delayed decision is actually a decision against God. Sometimes, I come back to the will of God. But many times my delay results in missed opportunities and missed blessings. While my desire to see a performance from God is not quite Herod’s mockery, I have selfishly desired things from Him. Our Heavenly Father does desire us to come to Him with our petitions and request, but how many times have I only come when I wanted something from Him? How many times I have cried out…. In contrast, how many times I have gone to the Lord when I wanted nothing. How many times have I gone to Him just to praise His wonderful name? How many times have I come into His presence just to be near to Him? My God gives me so much. Blessings flow abundantly from Heaven. But, I had to ask myself, If God never did another thing for me, would I still praise His name? If He never blessed me again, would I still serve Him? If He never answered my prayers, would I still love Him with all my heart? Or, do I only desire a performance? These are hard questions. And, while I did not deliver Jesus to death like Pilate, there have been times that I have been guilty of killing the testimony of Christ. I claim to be a Christian. In that claim, I say to the world that I am Christ-like. Yet, when I do not live and act as Christ did I am killing the testimony of Christ. Lord, you know my heart. My desire is to never deceive, deny, or doubt You. I do not want to delay in the things You would have me to do. And I pray that I lose all selfish desires and that my actions would never attempt to destroy Your name. Merciful Father, thank You for Your abundant grace. Your mercy endures forever!